I’d like to express my heartfelt thanks to Arielle Middleman for inviting me to visit the Library Company of Philadelphia yesterday to leaf through its early editions of Whitman’s Leaves of Grass–including a pristine copy of Whitman’s original 1855 edition. 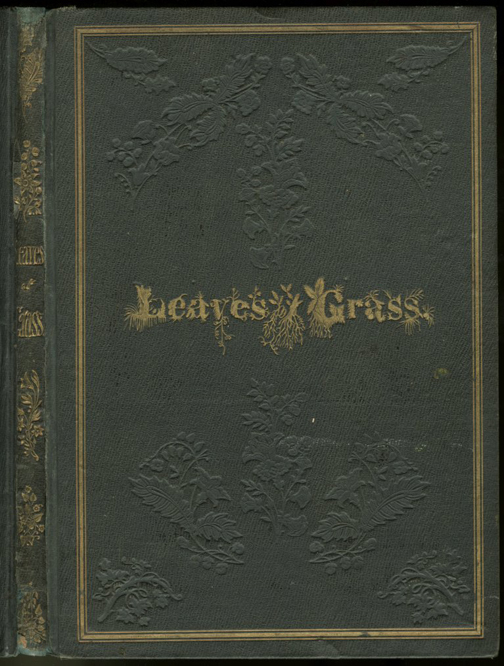 The Library Company of Philadelphia was the only American library to have bought a copy of Leaves of Grass at the time of its release. Having had only one home since 1855, the copy owned by the Library Company is in immaculate condition: vibrant marbled endpapers, intact binding, bright paper stock, and little or no foxing. It has to be one of the finest copies of the original Leaves of Grass still in existence. 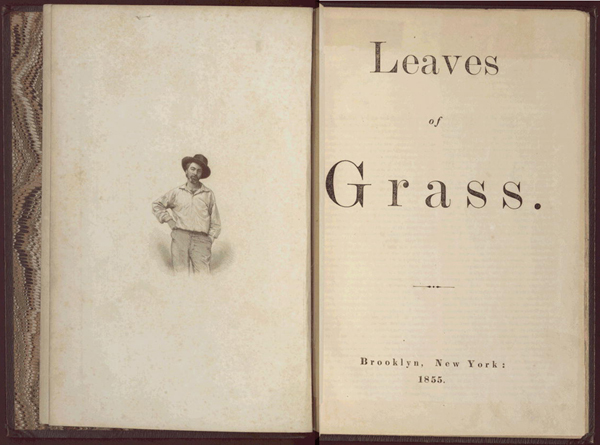 About 800 copies of Leaves of Grass were printed in the first run, but only 200 of those copies were bound in the trademark green cloth cover. Whitman, a former pressman, composed most of the metal type on the first edition personally. 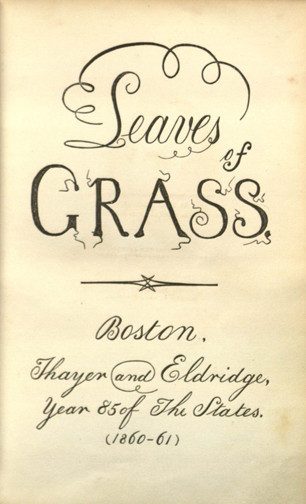 He selected a common, workmanlike typeface known as Scotch Roman, the letterforms of which were also used as a template for the vegetative lettering on the cover (speculation remains about who illustrated the letterforms on the book’s cover, but given Whitman’s hands-on approach, it was likely him). One could see irregularities in the text where the metal type and space blocks had shifted during printing. My hands were shaking as I turned the pages and felt the impressions left by the type set into place by the Good Gray poet himself. After being starstruck by the original 1855 edition, I picked up the smaller, heavier 1860 edition and immediately fell in love with the loopy typography of the frontispiece (I hope to incorporate the feel of those organic characters in the book). Another notable feature of the 1860 edition is the occasional small etching set among the poems, including what would prove to be one of Whitman’s emblems: a hand with a butterfly perched on the finger. I’m very fortunate to live in Whitman’s backyard; he’d left behind so much of his materials and personal effects here during his last decades. It would be difficult to do research on Whitman without so many kind friends who work in these venerable Philadelphia institutions that continue to safeguard his legacy. To see the editions made under Whitman’s eye, and to experience their tactile, olfactory and visual details enriches the process of giving his work a new incarnation. This entry was posted in Whitman Illuminated on August 18, 2012 by Allen Crawford.